Wildlife Animal Webcams: Watch Wild Animals In Action! 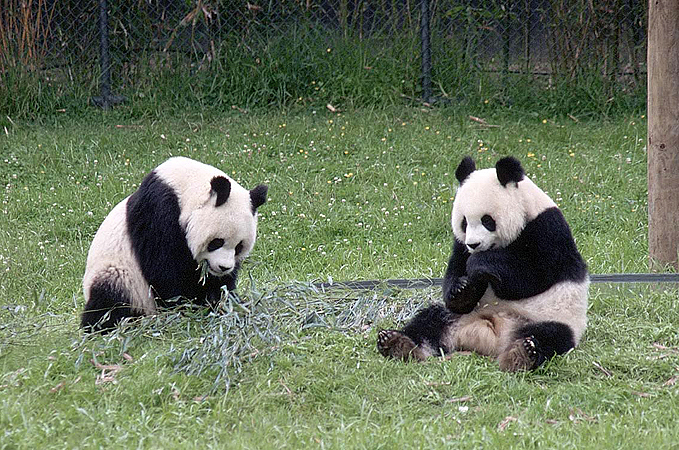 Following are links to “live streaming” animal cams featuring: baby pandas, elephants, giraffes, gorillas, apes, seals, black bears, polar bears, beluga whales, shamu, dolphins, and penguins. Pete Le Roux, the general manager of Mashatu Game Reserve in South Africa, set out to protect Botswana’s wildlife and give them room to run free in expanded territory. Concerned by the toll taken by wildlife poachers, Le Roux created his own watering hole in Africa. Then he set up a wildlife cam and began studying the animals there, with the greater vision to build links between all of the countries’ national parks and reserves. Pete’s watering hole (also known as Pete’s Pond) has been so successful at luring animals to this location that experts are concerned that some animal populations have outgrown the land. Here’s the wildlife cam. What’s cool is the fact that it’s actually LIVE and you can hear the animals as they’re walking into the water, the birds chirping nearby, and various animal ruckuses. NOTE: The camera is stationary part of the time, then it spans around to various places near the watering hole at times. As a result, you never get bored just waiting for an animal to come “into the screen”. They tell you when the best viewing times are. I checked it out at 11AM on a weekday and saw A LOT of activity! Embark on a quiet adventure and watch wildlife gather at Pete’s Pond. Baby baboons scurry in the dust. Wildebeests push and shove to make room at the watering hole. Warthogs wallow in the mud. Here’s a list of the different species you’re likely to see on the video. They’ve also got a daily blog which details their study of animal behaviors at this watering hole. If there’s not much going on at the time you tune in (if it’s pitch black at night or something), then take a look at their video highlights — saved video footage from previous days at the watering hole. A panda cub was born at the San Diego Zoo on August 2, 2005. According to my calculation (though I’m very bad at math), this would be on or about November 10th. In which case, I think she should be named “Lynnette” in honor of my November 14th birthday. Check out their website to see what name they ultimately choose for this cute little panda cub! Here’s the live streaming Panda Cam from the San Diego Zoo. At this point, she’s cute in that “ugly newborn baby animal kind of way”… The webcam does pretty much provide a round-the-clock view of her though. Another baby panda was born on July 9, 2005 at the Smithsonian National Zoological Park. This one is a boy, and his name will be decided on October 17th. This little guy is definitely in the prime of his “cute stage”! He’s full of fur and loves to roll around and sleep in front of the camera. EXTRAS: Panda fans will also enjoy the baby panda photos of this little guy, and the accompanying video. And don’t miss this video of the panda cub’s parents featuring their first days at the National Zoo.